If you are a looking for a perfect Philadelphia wedding venue, with a historic feet to it, don't look further than Finley's Ballroom at the Ben. Located only steps away from the Washington Square, Liberty Bell and the Independence Square, Ballroom at the Ben offers a classic, elegant backdrop for your wedding celebration. There plenty of Philadelphia top hotels located just blocks away from the Ballroom at the Ben. Your guests will have no trouble at all finding a perfect lodging for their wedding weekend stay. Kimpton Hotel Monaco, located at 433 Chestnut Street, always make the top of our list as this Philadelphia hotel is simply stunning. Overlooking the Independence Square, the Liberty Bell and the Second National Bank of the United States, Hotel Monaco will make your stay in Philadelphia just extra special. Another wonderful option where to stay in the Old City is the Renaissance Philadelphia Downtown Hotel. Located on the same Chestnut Street and only a few steps away from the Kimpton Hotel Monaco, The Renaissance Hotel has the same benefits in terms of historical sights being located very close. If you are getting married at the Ballroom at the Ben, make sure you have enough time allotted for your wedding photos inside the venue itself. With its majestic arches, ornately decorated pillars and exquisite chandeliers, the ballroom looks phenomenal and will be a magnificent backdrop for wedding photos of the bride and groom together. 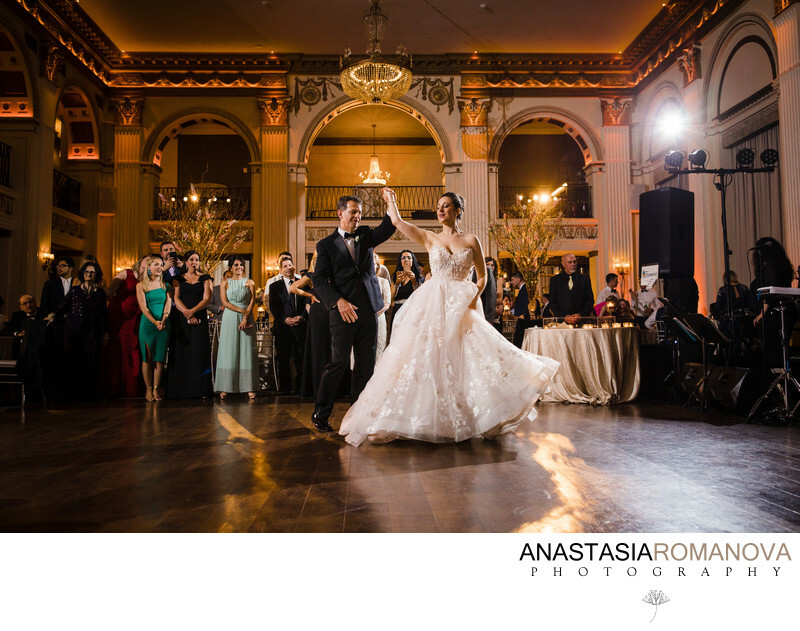 We love positioning our couple in the middle of the ballroom's dance floor and photograph them from the mezzanine level. With all of the reception decor being set up, this perspective at Ballroom at The Ben looks spectacular on wedding photos. Another picture perfect backdrop at Ballroom at the Ben is its iconic balcony, overlooking the city. It is a spectacular spot for both daytime and nighttime romantic photos of the bride and groom together. Make sure you take some of your wedding photos on the grand staircase at Ballroom at The Ben. With a huge antique mirror located right is the center of the stairs, it creates a unique setting for some breathtaking wedding portraits. The estimated average cost for a wedding at Ballroom at the Ben is between $19,750 and $30,400 for a ceremony and reception for 100 people. The Ballroom can accommodate up to 350 guests. Location: Ballroom at the Ben. Keywords: ballroom at the ben (69), best venues in philadelphia (78), black bridesmaids dresses (72), finley bride (78), finley catering (120), finley wedding (120), philadelphia city hall wedding photos (90), philadelphia wedding (432), philadelphia wedding photographer (450), philadelphia wedding venue (153), rodin museum wedding photos (123), top wedding photographers in philadelphia (78), wedding at ballroom at the ben (69), wedding photos at Ballroom at the Ben (69).